In World War II, the Battle of France, also called the Fall of France, was the German invasion of France and the Low Countries, from 10 May 1940, and ended the Phoney War. The battle was made up of two parts. In the first, called Fall Gelb in German (called Case Yellow in English), German tank units pushed through the Ardennes, to circle the Allied units that moved into Belgium. The British Expeditionary Force and many French soldiers were saved by Allied boats from Dunkirk in Operation Dynamo. 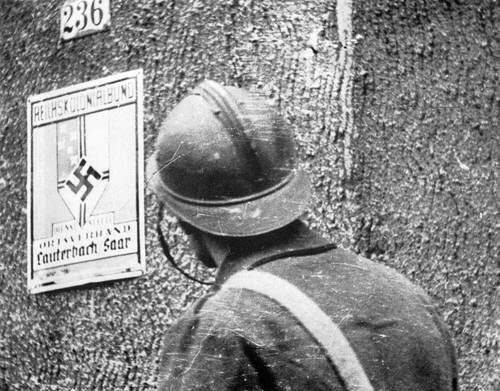 In the second part of the battle, called Fall Rot in German (Case Red in English), from 5 June, German armed forces circled the Maginot Line to attack the rest of France. Italy began the war with the Allies on 10 June. The French government left Paris for Bordeaux, and Paris was taken over on 14 June. After the French Second Army Group surrendered on 22 June, France then gave up as a country on 25 June. For the Axis, the Battle of France was a big win. Battle of France Facts for Kids. Kiddle Encyclopedia.